Ford has just revealed the Mustang EcoBoost High Performance Package for the entry-level pony car. No, it’s not called the Mustang SVO, but it is the model we saw in spy photos earlier this month, and when it reaches dealerships this fall, not only will the Mustang EcoBoost High Performance Package represent the most powerful four-cylinder sports car offered by an American automaker, but it will also be the best EcoBoost Mustang yet. The package starts out by swapping the standard 2.3L EcoBoost I-4 with a unique variant of the motor used in the Ford Focus RS. It then adds Mustang GT brakes, along with aerodynamics and suspension components from the Mustang GT Performance Package. The engine makes 330 horsepower and 350 pound-feet of torque. It features a die-cast alloy block and high-performance cylinder heads, the along with a five percent larger (63-millimeter) twin-scroll turbo compressor, as well as a larger radiator. 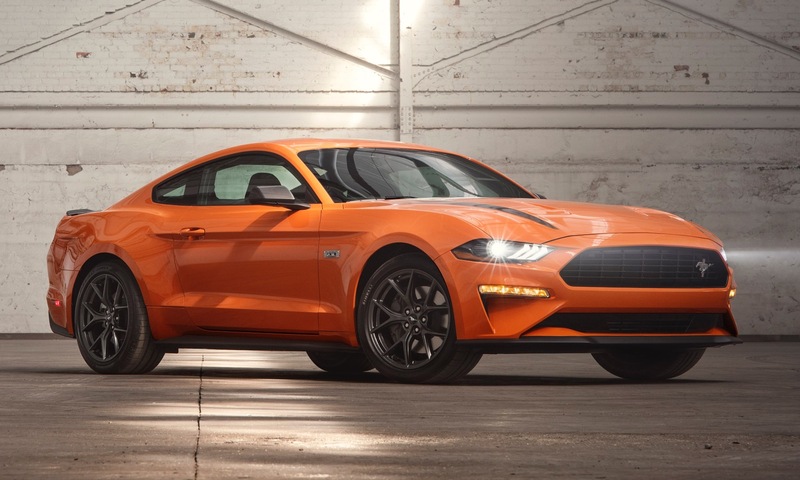 Models equipped with the Mustang EcoBoost High Performance Package will be available either with the 6-speed Getrag manual or the Ford-developed 10-speed automatic transmission. Ford claims the package will enable the Mustang to make a zero-to-60 MPG run in the mid-four-second range on to a top speed of 155 MPH. Over 90 percent of peak torque is made between 2,500 and 5,300 RPM – which is a 40 percent wider power band than the standard EcoBoost engine. The package also includes a fully active quad-tip exhaust system with a tuned exhaust note specific to this model. 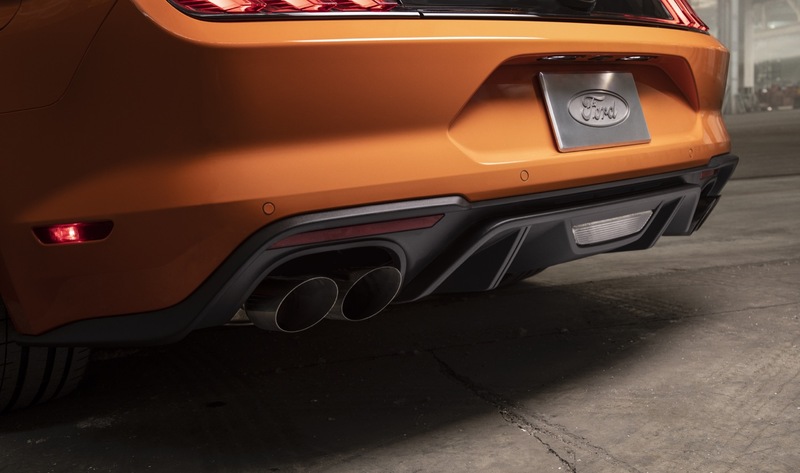 The high-performance EcoBoost pony features an (almost perfect) 53/47 front/rear weight distribution as well as a fully-independent suspension, along with chassis and aerodynamic upgrades from the Mustang GT Performance Package. To further stiffen the chassis, an alloy strut tower brace is present and accounted for. Underneath, there’s a 32-millimeter solid front sway and a tubular 24-millimeter rear sway bar. Ford tweaked the electronic-controlled power steering for the Mustang EcoBoost High Performance Package and there will be five selectable drive modes. There will also be brake cooling ramps from the Mustang GT Performance Package to keep maintain braking performance at the time. Visual enhancements to the Mustang EcoBoost High Performance Package include package-specific 19×9-inch machined-faced aluminum wheels wrapped in 255/40R high-performance summer tires. The HPP also includes a large black front splitter and belly pan, a blacked-out grille with an offset Mustang tri-bar pony badge, and a unique 2.3-liter High Performance Package badge on each side of the car. Magnetic gray side mirrors and a raised blade rear spoiler are part of the package, as are unique metallic gray stripes on the hood. Inside, there’s an aluminum instrument panel with oil pressure and turbo boost gauges, and a serialized dash plaque to identify the unique performance model. And if all of that wasn’t enough to get Mustang fans excited, Ford will also offer a new Handling Package that can be added to the EcoBoost High Performance Package. The Handling Package includes semi-metallic brakes, MagneRide dampers, and a Torsen 3.55:1 limited-slip rear axle. The model will ride on 19 x 9.5-inch painted aluminum wheels wrapped in 265/40R Pirelli P Zero Corsa4 summer tires and feature a 24-millimeter solid rear sway bar, up from 21.7 millimeters. The Mustang EcoBoost High Performance Package is available for Fastback Coupe and Convertible models. Meanwhile, the additional Handling Package will only be available for Fastback Coupe models. Both models will reach dealerships this fall alongside the 2020 Mustang.